A couple from Prince Edward Island, Canada, celebrated their wedding day with an eight-foot-tall potato named Tate the Tater as their special guest. 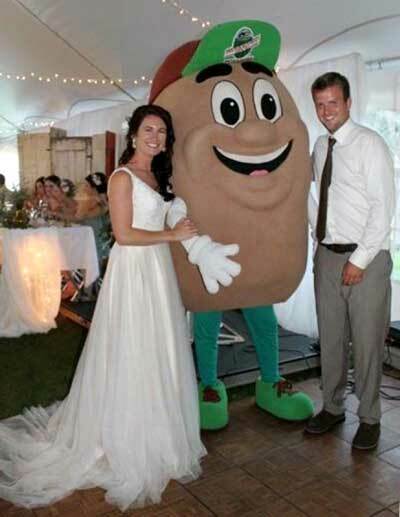 Tate the Tater, the industry mascot for the P.E.I. 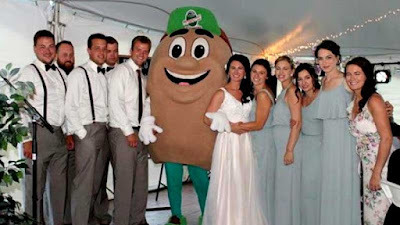 Potato Board, has been at a lot of events, but this was his first wedding. He was invited by bride, Amy Ramsay, 27, and groom, Matthew Ramsay, 27, who is a potato farmer. Matthew said Amy thought it would be good entertainment. "It would take the lull out of the reception when people are trying to eat and there wasn't any speeches going on, she thought it'd be a great idea." The couple, who live in Cascumpec, got married at the Elite Seed Potato Farm owned by the P.E.I. Potato Board. Tate was a surprise to wedding guests and a big hit with both children and adults.